If you are a hiker, camper, hunter, skier, or any other outdoor enthusiast, a walkie talkie is one of the most vital devices that you need to have. This device allows you to receive and send calls without worrying about phone signal reception, monthly service, contract fees or coverage charges because they do not require any area coverage by telecom transmitters, cellular base stations, or satellites. The best walkie talkine can even give you a variety of tools which include SOS signals and weather alerts. Modern units have also improved radio ranges, frequency options, and have reduced their weight, so you won’t feel overly burdened when hiking. To help you out, we have outlined some of the features that you should look for when buying a two way radio. Further down, we have also picked out some of the best models that should be worth your time and money. Let’s get right to it! There are a lot of walkie talkies that have different features that can be perfect for some people, but useless for some others. Durability, frequency, size, the number of available channels, operating range and codes for communication are some the most essential aspects to consider when shopping walkie talkies. Since our goal is to help you choose the best of the best, we have decided to explain some characteristics that can be read in the following paragraphs. The higher the number of channels, the higher will be the price. The number of channels ranges from 2 to 22. If there are several channels available on the walkie talkie, it will help you communicate with multiple people easily. A higher number of channels give quick messages sending facility and clear voice quality. Spending on an increased number of channels without any special use may not be wise for you, however. When it comes to frequency, there are two basic options: VHF or UHF. While somewhat similar in composition, these frequencies are never compatible with one another. With a walkie talkie you can communicate using one channel, but the major disadvantage is that the same frequency channel is used for both sending and receiving information, so only one person can talk at a time. The range can vary quite a bit on handheld two way radios. All the radios have listed their optimal or maximum range on their packing. Be very wary of that range you see on packaging. Buildings or trees in the way might disrupt the signal of some devices, so you will probably get a fraction of that range. The maximum range is achievable only when both the receiver and transmitter are in the line of sight without any obstructions. One of the most consistent frustrations with a walkie talkie is the battery life. In the developed world, a dead battery is not just a disappointment, but can often lead to a very dangerous situation. That is why being familiar with the different types of batteries is vitally important for a walkie talkie user. Nickel Cadmium batteries tend to have a long life, are the cheapest, they don’t have issues with overcharging and have been around for long. Nickel Metal Hydride batteries, however, are less susceptible to memory burn, but can have issues with overcharging, and they tend to be more expensive. Look for a device with long battery life if you want to use walkie talkies in the outdoors for more than one day. When you are in the backcountry, you have to be prepared for everything, being the rain one of the most common and important things to be ready for. Consequently, a pair of waterproof two way radios is a must. Pay attention to the IPX rating. The higher the IPX rating, the more waterproof the radio device is. This will tell you what kind of wet conditions the radio can actually resist. Modern technology has made it possible to pack a ton of power into a small space, which is what walkie talkie users are looking for when it comes to the convenience of staying in touch without the hassle of bulk. Lightweight walkie talkies are more comfortable to use and carry, particularly if you need them for a backpacking trip. Durability becomes a vital factor when it comes to walkie talkies. How well a radio holds up against reasonable amounts of impact determines just how useful it can be. They should not only be waterproof, but also be a submersible model, so even if it is accidentally dropped into water, it should float on it rather than drown in the water. Walkie talkies are made of different range, the bigger the range the better the performance. Look for a walkie talkie with both GMRS and FRS frequencies. FRS frequencies are free and easy to use but usually have shorter ranges. GMRS channels need an FCC license to operate and offer longer ranges. There are different walkie talkies that you can find on the market, so you have to compare some available products before choosing the best device. These walkie talkie reviews are recommended for people who want to find the best device that suits their needs. To help you make your decision, we have taken the time to analyze and research the best devices available today. The Spy Gear Ultra Range Walkie Talkies is a clear communication two way radio with a range of up to 2 miles away. The click and hold communication button allows you to easily communicate with each other, all you need to do is just hold the talk button to communicate with your group and release while waiting for a reply. The high tech design delivers an authentic spy experience and requires 6 AAA batteries for operation. People who have bought this product said that the audio signal was very clear even when used with trees in the way. Also, they say that the materials used to build the radios are very sturdy and can take a beaten. 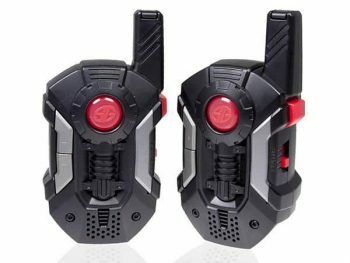 These walkie talkies are most recommended for kids. However, people have found some problems. The first one is that the batteries are drained very fast, so you have to make sure to turn them off when you are not using them. Also, from time to time, the talk button gets stuck and you need to use something sharp to solve the problem. Finally, you have to use a screwdriver to install the batteries, which have been perceived as a problem for many users. Related: Another great addition for your kids while camping is the Spy Gear Night Goggles. They have bright LED lights and blue lenses that improve night vision; a scope that allows you to see objects from long distances; and they work with a set of 3 AAA batteries. The Retevis RT628 Two Way Radios are a great choice to communicate with your friends or family due to the multiple features,like the VOX function or the LCD display included, they have. Being able to reach up to five thousand feet depending on environment and terrain, these radios are another great choice for kids. A PTT button lets you communicate when you are unable to speak. 3 AA batteries are required for operation. Its small size makes it convenient to carry around, even for smaller hands. People say that they are good quality because the voices are transmitted very clearly,that the materials are pretty tough and that the power selection mode is very useful to help reducing the battery usage. Nevertheless, people have complained about their range. They say that 1 mile is just not enough for serious outdoor activities. Also, they say that even with the power selection function, they battery do not last long, and that they are not waterproof. 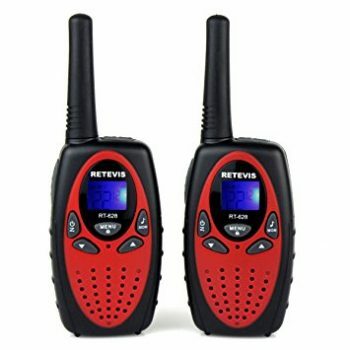 Related: We also recommend the Retevis H-777 Two Way Radios because they come with a rechargeable battery that last up to 8 hours, low voltage alert, have a simple design and includes earpieces, so you can communicate in hands free mode. The Cobra CXT235 Two Way Radios are portable, small and easy to use. They aregreat for traveling, as the belt clip fits efficiently and comfortably at your side.Be prepared for emergencies and storms with built in NOAA radio receiver. The CXT235 is a lead free product and has eco friendly packaging. 8 AAA batteries are required for operation. Buyers have said that one of the best characteristic of these Walkie talkies is their range. The company claims they reach up to 20 miles, which is more than enough for any serious camper. Also, they say that the quality of the audio is on the top, and that they are made of sturdy and resistant materials. However, there are some user that have a different perspective on these radios. They say that the battery life is not enough compared to other units. Also, people complain about their sound volume since they say it should get higher. Finally, they say that you should be aware of their static that in some situations might be quite troublesome. Related: The Cobra Compact Solar 6000 mAhPowerbank is our recommendation for those who cannot let their devices die while camping. It can quickly charge phones, tables and other mobile devices; it can be charge using solar energy or via USB; and it has a LED meter that indicates battery level. 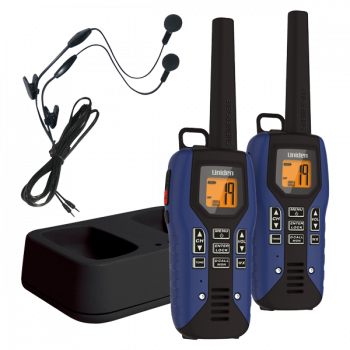 The Floureon 22-Channel Two Way Radios come in a handy pack of two, ideal for you and your family and also they have the perfect portable size for outdoor adventures. Easy to carry, lightweight with ergonomic design for belt clip and firm grip for easy attachment when not in use. They also have smooth and crisp quality sound with adjustable volume level. Users say that one of their best features without a doubt is that they have 22 channels, so you can be sure no one you do not want to will listen what you are talking. Additionally, the battery life of these units seem to be really long lasting, which makes them great for the shopping center, supermarket, hiking, hunting, camping, festival, and any other outdoor activities. One major downfall that these Walkie talkies have is that the range is not enough for most outdoors enthusiasts (around 2 miles). Also, people say that they are difficult to use since the menu has too many features; and that they are not as sturdy as they should. 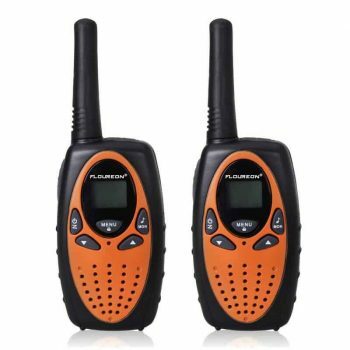 Related: Floureon also have a different type of two way radios; they are the 22 Channel Walkie Talkies UHF462-467MHz. These units provide a good sound quality, lots of channels to choose from, a fair range and work with a set of 6 AA batteries. 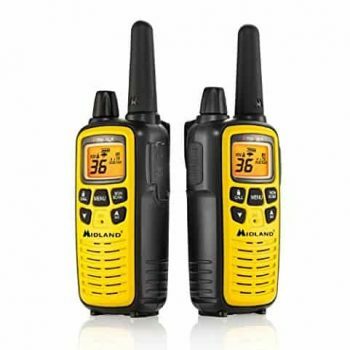 The Midland LXT630VP3 Walkie Talkie is a multiple purpose FRS/GMRS two way radio for hiking, camping, or all around family activities with NOAA Weather scan and Weather alert which makes it an excellent choice for your next outdoor adventure. 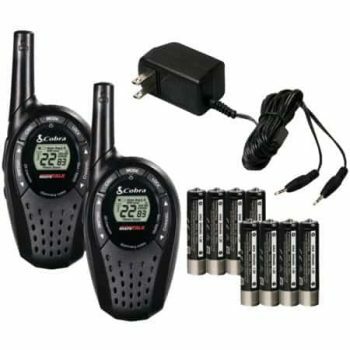 This product also includes three AAA batteries or rechargeable battery pack making these two way radios a flexible option. According to some reviews, these walkie talkies are made with a system very easy to use, so it is great for both kids and adults. Also, people say that these radios provide a clear sound in most circumstances, and that you can disable every sound to reduce battery usage. On the other hand, people have said that the 30 mile range is not as accurate as it should. In fact, they say that its actual range is about 5 miles. Additionally, users say that they do not hold the charge for long, and that the base charger is difficult to use. 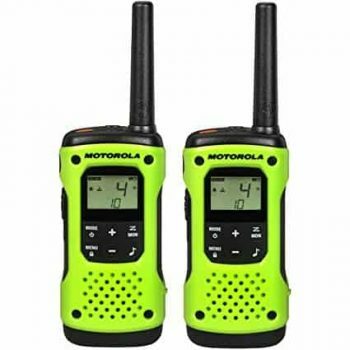 Related: The Midland LXT535VP3 is another good pair of Walkie talkies since they have 22 channels, they reach up to 24 miles in optimum conditions, you can choose between Hi or Low power usage, and are compact and easy to use. The Motorola T600 Talkabout Radios are an excellent hiking and camping option. It features a full range of controls options and never feels burdensome while also being waterproof. They come with a flashlight, 22 channels with private codes, 11 weather channels to always be aware of whatever might happen, and so on. It delivers a great combination of range and voice clarity and in terms of functionality. Additionally, people say that they are very easy to use, very compact and easy to transport, that their battery life is long lasting, and that they are very sturdy. Nevertheless, these radios have the same problem that the previous ones have. The provided range is not the same as the one the company says. Users say, as well, that the volume is not as loud as they should, that they are not as water resistant, and that they have a lag time of three seconds. Related: The Motorola 1518 Surveillance Headset is a great addition to the Walkie talkies since it provides a discrete way to listen and speak, it works with every Motorola units, are easy to install and have a clear sound. The Uniden Submersible Two Way Radios are strong FRS/GMRS two way radio designed for outdoor adventures. This rugged walkie talkie is packed with functionality and features for hunting in the woods, hiking in the wilderness, skiing in the mountains or other extreme outdoor activities, and it can be powered by 3 AA batteries. In addition to the features usually found on the high end Uniden models, the GMR-5095-2CKHS auto channel change will update all radios in your group to a new channel to help reduce interference. The direct call feature permits you to communicate privately with one specific member of your group. Additionally, they are waterproof. These walkie talkies have some problems, however. The first one is that the range is too short, reaching up to 3 miles, the second one is that the sound provided by the radios are not as clear as the rest from the list, and they are not as sturdy as they should. Related: Another great option would be the Uniden GMR1635-2. They have 22 channels to choose from, they are very compact, have an ergonomic design, they work with AAA batteries and have little to no interference. 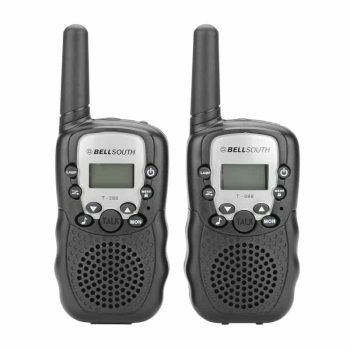 The Bellsouth T-388 Walkie Talkie includes 2 walkie talkie units: these are communication devices that operate on mobile radio frequencies. 4 AAA batteries are required for operation, they have 22 channels you can choose from, and they are the best gift for your friends or family members. One of the best features these radios have is that the sound they provide is very clear, so you would not have problems understanding your friends. Also, they have a lock system to block all buttons except the talking one to avoid your kids to changing the channels, and they are built with materials that can withstand a beaten. The issues people have found with these Walkie talkies are that the range they provide is not too long. Additionally, they have a too childish design, so it is not for serious purpose. Finally, the battery contact become loose, so you never know whether they are charging or not. Related: The Bell South 2250-BK-2 Walkie Talkie is another great set of Walkie talkies made basically for kids. They can reach up to 2 miles, they have 22 channels in both FRS and GMRS frequency, VOX system, and provide very clear sound. Stay in touch with fellow campers or hikers with this Cobra Electronics CXT545 walkie talkie device. A total of 2,662 channel combinations are available when the 22 channels are combined with the 121 privacy codes (38 CTCSS/83 DCS) to prevent interference from other radios, while offering (according to the company) 28 miles of range. The waterproof feature allows you to be ready for whatever nature throws at you when on camping trips. The voice activated transmission frees your hands for other tasks. The walkie talkie is extremely portable and won’t burden you while you hike. Nevertheless, people who have bought these units said that it is not fog proof, since once they have been in contact with the water, the screen becomes foggy. Additionally, the battery device charges the radios rather slowly, and they are not as sturdy and durable as they should. Finally, they cannot reach 28 miles, but can provide a clear voice around 5 miles. Related: The COBRASELECT CPP 300 Backup Battery is a must have gear for campers since it provide a fast pace charge, it is compatible with most devices, can be charged with the sun energy due to its solar panels, and is compact and portable. Two way radios are getting more popular on a global scale. When shopping for walkie talkies, it is vital for people to take their time to compare and contrast various available models. In this review, we hope that we’ve given you some detailed guidance that you can put to use when you want to purchase walkie talkie. 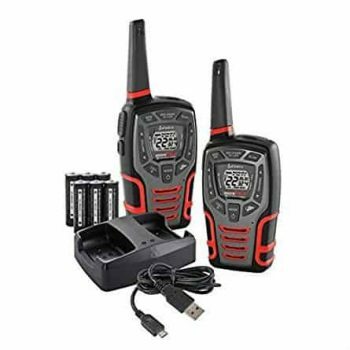 Think about where and how you will use them, and then check customer reviews to see if buyers in areas like yours achieved the range you need before making a tough decision of buying the best walkie talkie which will give you the maximum value for money. So, what type of walkie talkie do you use? Is there something else you use to figure out what the ideal option for you is? Share your thoughts in the comments.